Valentine’s Day on Secret Seal Isle means flowers, chocolates and champagne brunch. But cupid doesn’t shoot straight to the heart this year. When a secret love nest is found in a storage unit, racy lingerie isn't the only shocking discovery. And the corpse just happens to be the long-time missing wife of Winter’s new love, Blake. When Rain tries to help clear Blake’s good name, she lands in a bizarre love triangle of her own. Fortunately Cookie is on the case, with her own Valentine, Dylan by her side. That is until their relationship is thrown of course when Hunter arrives to help. Cookie discovers her former partner isn’t ready to let her go. With relationships under fire and a body on ice, Cookie needs to solve another murder and find a way to save Valentine’s Day. This is another great read in this series of books. If you haven't read any of the books before this one don't Worried because each book has it's own beginning and ending. Cookie is up to her neck again trying to solve another mystery . This book has you laughing out loud mystery intrigue and of course romance. In general it's just a great read. I voluntarily reviewed an advance reader copy of this book. Winter has a new beau; while Cookie and Rain face their men walking away! Typical fare for those living on the Isle. Don't forget the body on ice. Oops, I meant the bubbly! Anyway, with these characters you can count on an excellent and whimsical Valentine's read! Voluntarily read ARC for honest review. In the last book, Cookie had finally made her decision. Dylan. They are great together. Things are going well until they get a 911 call from Rain, her mom could need money for groceries or she could be arrested--again. No such luck. Another dead body. This one is even stranger than the other cases. Dylan buddies up with her to help until--yep, you guessed it, Hunter get's called in. Of course, her former FBI partner isn't happy to stand around watching her with her choice that left him in the cold. This is around Valentines Day and maybe all the decisions about which man she wants isn't settled. The hunt for the killer takes them all over the Island. There are some very funny situations, some romance and romantic problems. The entire story is fun, with action and characters you can't help but love. One thing you can count on, there won't be a dull moment on Secret Seal Isle. I voluntarily reviewed this advanced reader copy and I have not been compensated in any way. 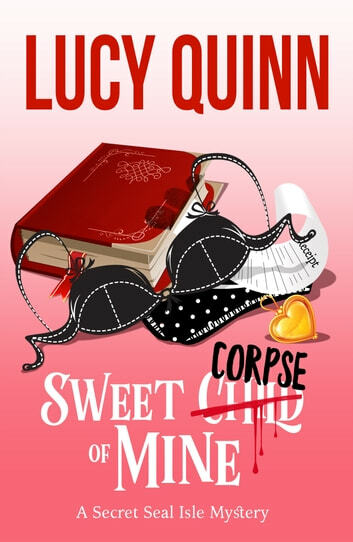 SWEET CORPSE OF MINE is a THRILLING Mystery. Inside; witty dialogue, flirtatious innuendos, gripping suspense, chilling action, hot alpha men, life-threatening moments, hilarious and dynamic vivid scene descriptions, jealousy, emotional moments, and sweet romance. Secret Seal Isle is buzzing for Valentine's Day; Cookie has a date planned with Dylan who sets her world on fire. Unfortunately, an untimely call from her mom has her investigating another murder. Hunter her ex-FBI partner shows up unexpectedly; jealousy runs wild between Dylan and Hunter making Cookie a bit tense. LOVED this Fantastic page-turner which had me laughing, sighing, and on edge too. I adore the characters in this series, all engaging and full of life. If you enjoy romance with a murder mystery twist this is definitely a great book/series for your library. I enjoyed this story so much, (I voluntarily reviewed an advanced copy.) Without reservations, I recommend this book. I love this series it's awesome Secret Seal Isle is never dull. Cookie and her mom ( Rain) moved here after a mob boss promised to kill Cookie. She try's to live a quite live with her mom best friend scarlett and her boyfriend Dylan but crimes keep happening around either rain or cookie putting them right in the middle. This time it's Rain who finds the dead body and Cookie has to call in her ex partner Hunter to find the real murder and saved an innocent man. Oh wow amazing 10 stars! I love the characters all of them they seem to just come alive. The story is full of action, drama, mystery, romance, suspension and so much more. I couldn't put it down it had my laughing. What a surprise ending I can't wait for the next book. Voluntarily reviewed a copy and I honestly loved it.